"The catastrophic earthquake that destroyed buildings in Ecuador on Saturday became far more devastating Sunday, when the death toll soared to 238 -- and it's expected to rise. 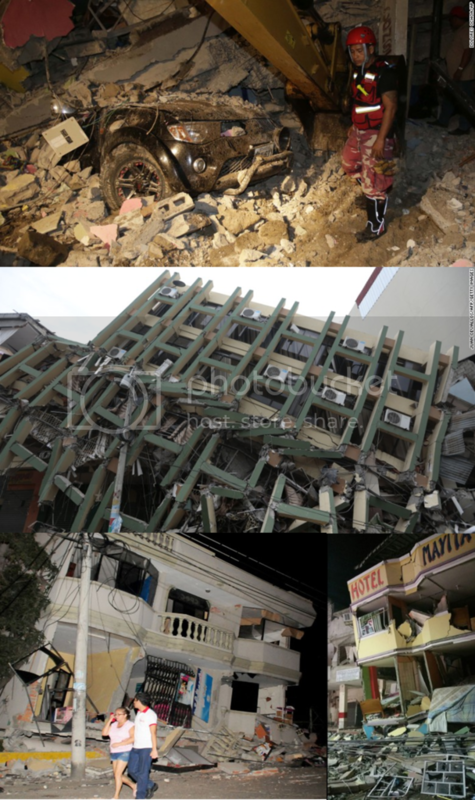 At least 1,500 people were injured, said Ricardo Peñaherrera of Ecuador's national emergency management office." The 'pong' to Japan's double 'ping'? There was a 5.8 magnitude earthquake approximately 241 miles east of Barbados about 5 hours ago, not to mention the 6.1 aftershock that occurred near Muisne, Equador, less than 2 hours earlier. Judging from what I've recently been observing at http://earthquake.usgs.gov/earthquakes/map/, the earth seems to be in an active earthquake phase. Hopefully, the one near Barbados isn't a foreshock of the great quake (8.0+) which some geologists in this region have been warning is long overdue for the Eastern Caribbean. Pretty sad situation in Equador though.